Biological invasions occur when species are introduced and successfully spread in geographic regions outside of their native range. They can pose environmental problems, but at the same time can be viewed as “natural experiments” to study the factors shaping species distributions and biotic interactions. We use comparative studies of plant invasions, especially those occurring along elevational gradients in mountains, to understand the ecological and evolutionary factors limiting the spread of non-native species. High mountain ecosystems remain little-invaded by non-native species, with steep declines in non-native plant richness along elevation gradients around the world. Within the Mountain Invasion Research Network (MIREN), we seek to understand these globally consistent patterns, thereby gaining insight into the mechanisms driving invasion dynamics more generally (e.g. propagule pressure, biotic interactions and rapid evolution) and helping to protect relatively pristine high mountain environments. 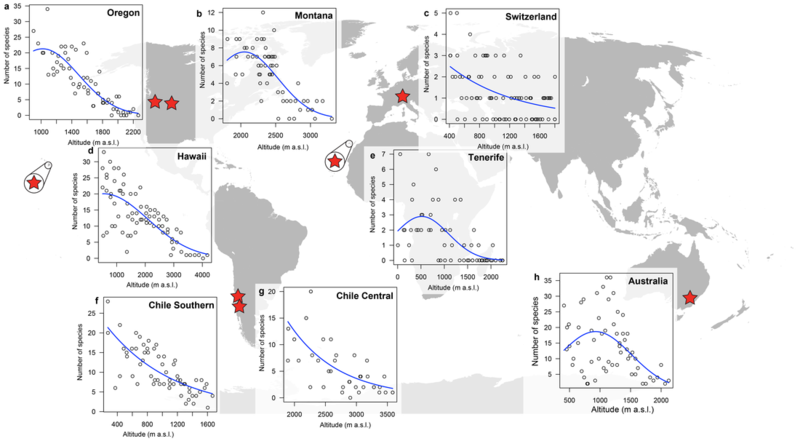 We showed that non-native plants reaching high elevations around the world are consistently widespread generalist species, predominantly from Europe, which can be explained by historical low-elevation introduction pathways coupled with climatic filtering as species spread upwards. Currently we are monitoring non-native plant distributions along elevation gradients using a standardized protocol that is being replicated in mountain regions around the world. We are also conducting globally-replicated experiments to better understand how invasion dynamics might be influenced by climate change.